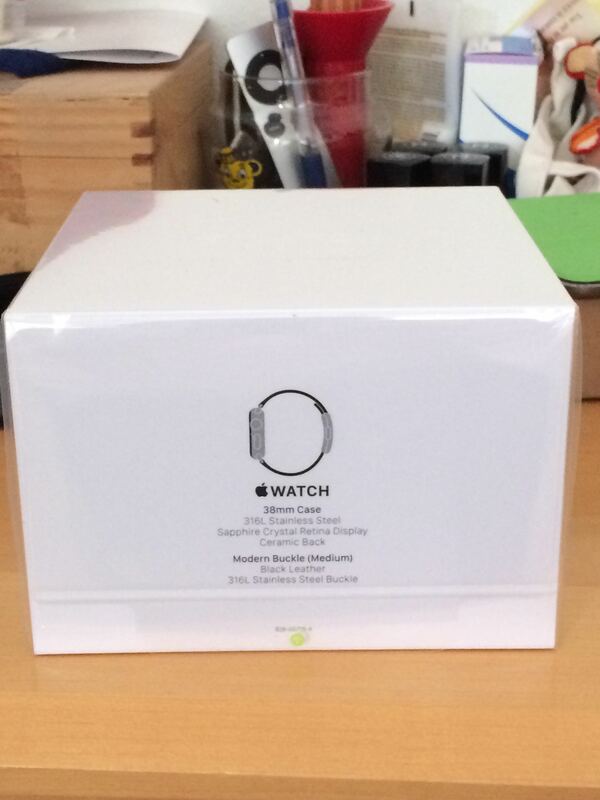 My very first impression when I opened up the Apple watch package “ Wow!!!! So cute, What a fancy, fine jewel”. I’m like a 7 year old girl opening up a Christmas gift on Christmas day. This package sets Apple once again above and beyond not just the technology segment but also the retail/fashion industry. Apple Inc. continues to strive for what Steve Job believes that the “package” is like a storefront that attracts customers and helps retain them as return customers. The second surprising impression is how seamlessly and silently my iPhone 5s syncs with the Apple Watch the moment the Apple Watch powers up; the Apple Watch app is ready on my iPhone for me to manage/set up the watch. 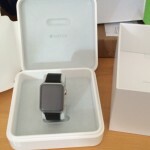 It came as a surprise to me because the watch asked me to enter a passcode from watch app on iPhone, and I screamed at my poor husband – “ I don’t have watch app installed on my phone”. However, app is already installed and ready for me to use. Third – the charging station is so unique and cute. ☺ It’s another watch face and serves as watch stand as well. Just put the watch on it in anyway and just like the magnetic connection, and it will connect and start charging. It doesn’t take a whole lot of space as well. I placed the charging station right on top of my Sonos speaker, and it fits right in. The color and style blend in perfect harmony becoming another great decoration on my nightstand. Now, comes the fun part – user experience. Incoming calls – I tested it out in two very different environments: inside of the house, and outside in the heavy traffic of a shopping mall. 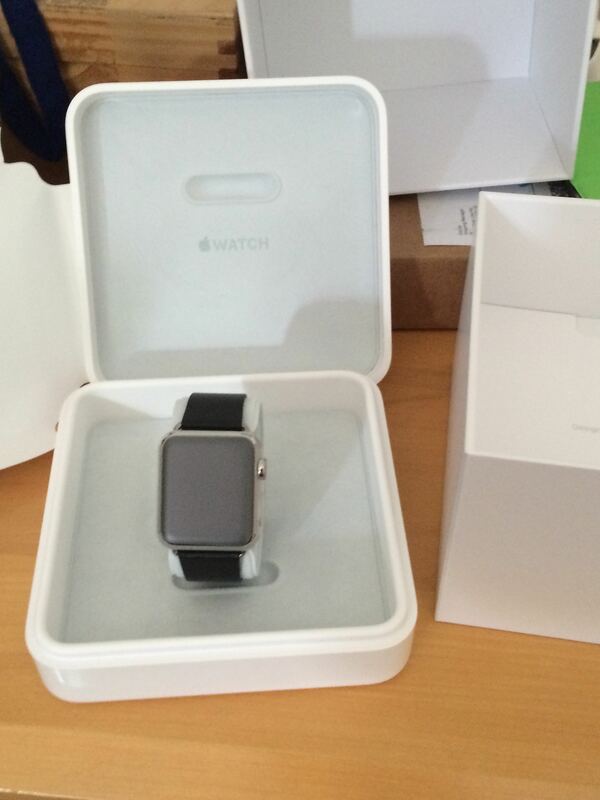 The watch has excellent voice reception – a great quality sound. I switched it back between phone and watch (while I was tested it in the mall), and it turns out watch sound quality just a tad better than my 5s. If you have a 6 or 6+, it might be a different story. 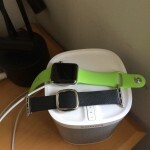 The voice does fade in and out (tested at home) depending on the distance between watch and mouth. The sound quality is still clear when the watch is more than one arm distance away from the location of the sound. Switching between the iPhone and watch happens immediately, seamlessly. I picked up a call from the watch, and it automatically switches to the phone when I finally find my phone. No need to pause or hold the call before doing the switch. 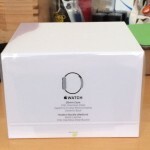 iMessage – there is actually no keypad to reply to text messages on the watch. However, the watch does its best to interpret how to reply and provides several options for replying to the message. If a quick reply message isn’t what you want, then you can use Siri to send audio or text for a reply message. I was so surprised and shocked how much Siri has improved over the last few years since Siri was first released. I have a slight accent, so Siri could never 100% correctly translate my message or contents. So I haven’t used it since I first tried it the time Apple released it on the iPhone. This is the first time that I’ve been very pleased with Siri. The accuracy of dictation from speaking words has improved tremendously. Battery life – since I just received it, like a new toy that I’m constantly playing – frequently checking my heart rate, iMessage, taking calls and monitoring my daily activities. Therefore, I need to charge it every night so far. It all depends on your usage and your lifestyle that will determine battery life. Charging on a daily basis is not a surprise to me since I do charge my iPhone every day, sometimes even twice a day. I’m a power user, highly dependent on my iPhone. Now, I’m hoping the watch serves as an extension of my phone, can balance out the battery life between my phone and the watch. Let’s HOPE! LOL!! Download App – the watch taps into your phone’s Wi-Fi/Cellular depending on your physical location. You can manage what app(s) you would like to add onto the watch from your iPhone’s Apple Watch app; it will automatically show up on your watch and shows the download status dialog. I tested with the Shazam app; it works just like how it works on my phone instead it’s on my watch. This feature serves me so perfectly while I am in my Zumba class or walking in the mall when I hear some interesting music and want to know more about it, I don’t have to dig into my purse and possibly miss the song by the time I find my iphone. Heart Rate/Daily Activities App – It’s what I use the most, and the health apps are the main reason I wanted the watch. The Modern Buckle leather band has been giving me quite good measurements on heart rate and my daily activities. 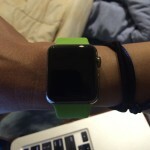 Then I switched to the sports band as reviews indicated that it gives the most accurate heart rate reading. However, I don’t see much difference in my daily activities. Zumba is the only fitness that I do. 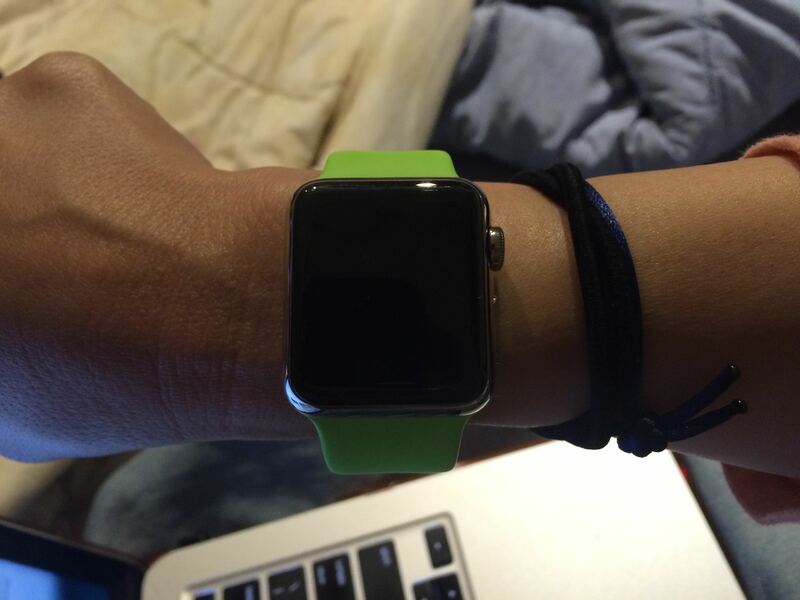 Plus, I have a very small wrist, the leather band actually fits my wrist much better than the sports band. The issue with leather is that it does not absorb sweat so during exercise it will wobble a bit, but the sports band less so. Because I can’t fit the sports band as tightly as the leather one, I find that the readings as far as heart rate and daily calories burn tends to be similar with both bands. 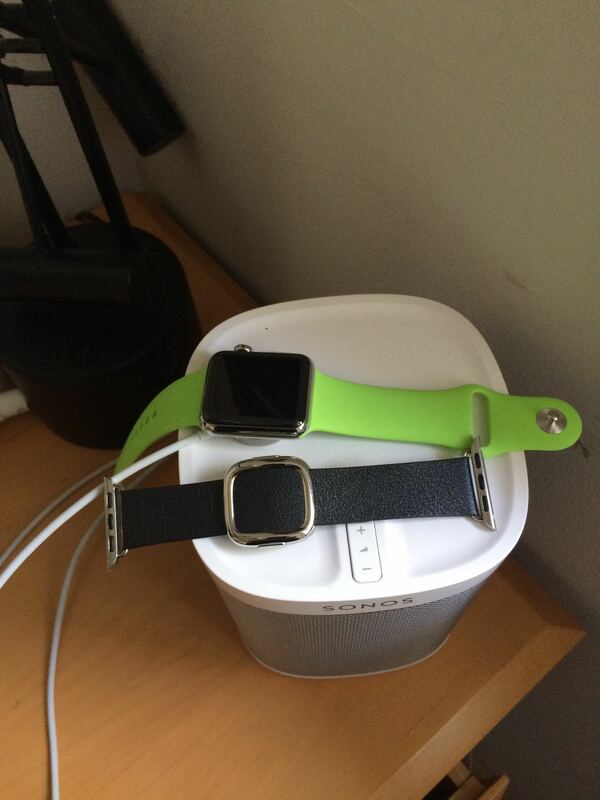 That’s pretty much all that I have to say for now about my experience with the Apple Watch after one week of usage. I’m enjoying and loving every minute of it. The watch meets my original expectations for getting it and exceeds my satisfaction on other features such as answering phone calls from the watch. My suggestion is to don’t just think of it as a “watch” and purchase it as a “watch”; think of it as a useful “extension” of your iPhone.